One more post about my new Island Blooms Go Round Tote...I am loving how it coordinates with my new Peacock Jack Rogers sandals!!! Can't wait until the summer!!! You will look so cute with those two together. I picture some black capris, a cute white shirt, and great turquoise necklace. Where did you get this? I would love to have a pair of sandals! :) I just started getting items in this print for my trip to FL! Omg that's crazy! they look amazing together but what's even more weird is that if you go on the Vera Bradley website and look at all the old patterns, there is a pattern called peacock, and it's the same pattern that's on the jack rogers. i took both the pictures and pasted them on a blank word document to compare, and it's the same EXACT pattern! 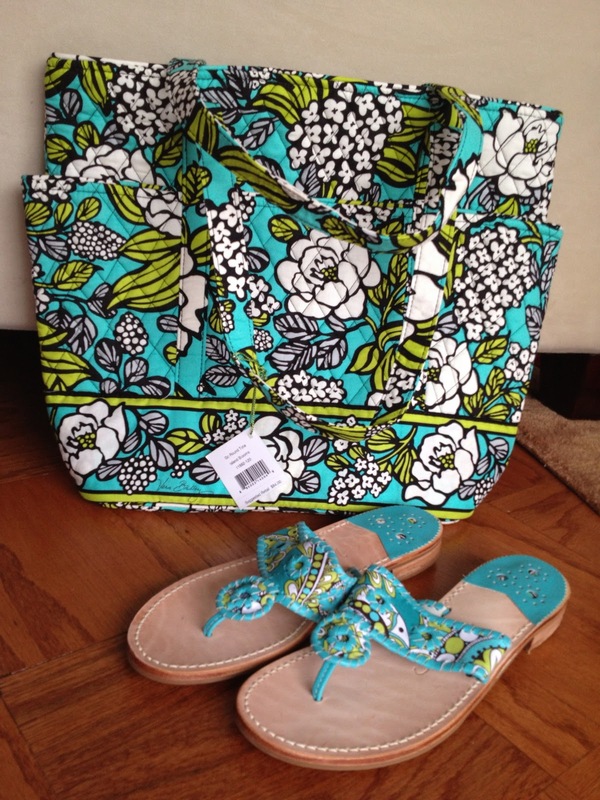 That's cool that the sandals go so well with the bag, though.